Tauranga rose breeder Rob Somerfield received the New Zealand Rose Award for services to the rose in New Zealand. The award is presented by the New Zealand Rose Society but is not an annual award. Society vice-president Hayden Foulds said it is is awarded only when there is a suitable candidate. "From an early age Rob's interest in roses was captured by roses growing beside his grandfather's milking shed and by three growing in his mother's garden. "By his late teens, he was growing his own roses and after leaving school, he learnt to bud while working at a rose nursery. "After completing a Diploma in Horticulture from Massey University in 1983, Rob began breeding roses. He also began to show roses, including his own seedlings, at rose shows around the Upper North Island. "Rob also joined the Bay of Plenty Rose Society and has been a member of the society for many years. He has served on the committee and is a consulting rosarian. He also regularly donates roses for raffle and show prizes. "In 1996, Rob and his wife Linda established a nursery, Glenavon Roses near Tauranga. This coincided with the release of Blackberry Nip in 1998. This was the first rose from his breeding programme. "It has been followed by nearly 40 other roses and Rob has become recognised as New Zealand's leading rose breeder. In 2017, he received the Plant Raisers Medal from the Royal New Zealand Institute of Horticulture (RNZIH). "Rob's roses are grown widely around the country and are known for their health, freedom of flowering and range of colours. Health is very important to Rob and it is something he has worked very hard on since first starting breeding roses. "Although not bred for exhibition, several of Rob's roses have become firm favourites with exhibitors at shows around New Zealand. These include Forshaw, White Romance, Pacific Glory and Wild Cherry. "Rob has high standards with his roses and will not release any if he doesn't have total confidence in its performance. He is also generous with naming some of his roses for various causes. Examples include Scent to Remember for the local Te Puna Hospice, Looking Good for the cancer charity and Everlasting Hope for Postnatal Depression Canterbury. "There has been much success for Rob at both the Palmerston North and Hamilton rose trials with numerous awards gained at both. At Palmerston North, Rob has won the top award, the Gold Star of the South Pacific eight times. This is an impressive record, second only to Sam McGredy. Even more impressive are the 22 other awards he has won since his first, the Silver Star of the City of Palmerston North with Blackberry Nip in 1998. Rob has also served as an industry representative on the Trial Grounds Committee since 2008. 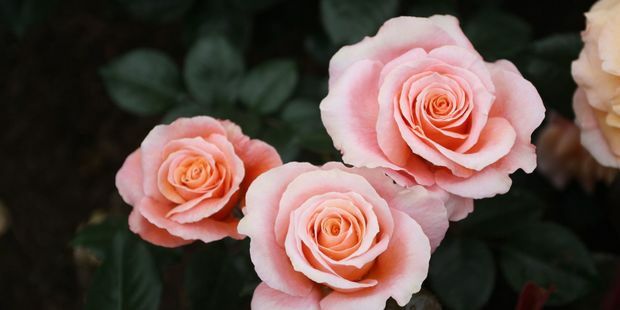 "At the New Zealand Rose of the Year trials in Hamilton, Rob's roses have gained 36 awards including the overall New Zealand Rose of the Year winner five times. One of the categories Rob likes to win is the Children's Choice award because as Rob says 'the children like what they like'. Rob also acts as a trustee for the Pacific Rose Bowl Festival in Hamilton. "Rob is very generous with his time and knowledge encouraging other rosarians to breed roses. He is welcoming to visitors to his nursery and provides feedback on seedlings he is assessing. His wife Linda and children Kate, Amanda and Andrew have all supported Rob with his endeavours with the rose. "Rob implants his many fine roses into the hearts and gardens of the people and is a deserving recipient of the New Zealand Rose Award."